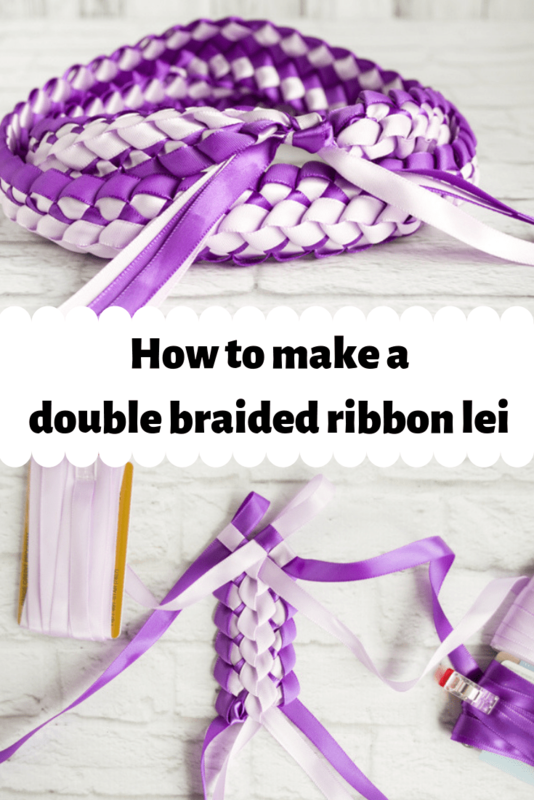 This easy tutorial shows you how to make a double braided Hawaiian ribbon lei with four strands! 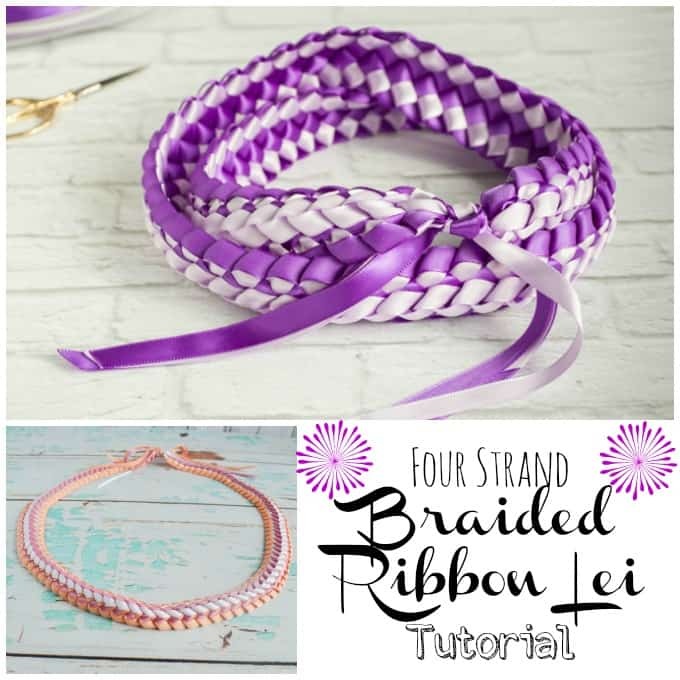 Remember when I shared how to make a basic, two strand braided ribbon lei and promised that a tutorial for the more complex, four strand version was forthcoming? Here it is! 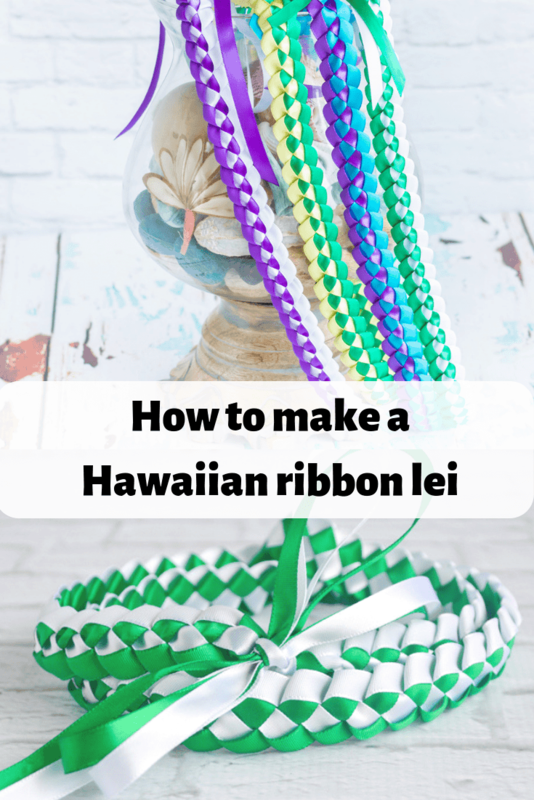 Today I’m sharing how to make a double braided Hawaiian ribbon lei with four strands of ribbon. 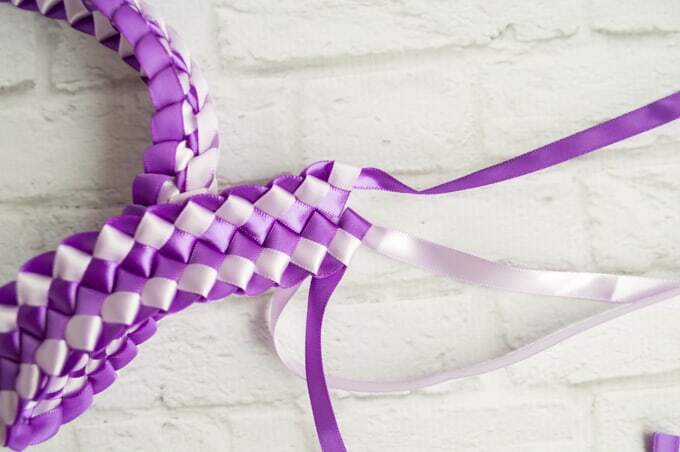 Honestly, it’s still fairly simple in the grand scheme of ribbon leis, but it’s complex enough to look special and can be pretty wide when made with ribbon larger than 1/4″. It’s great for occasions like Mother’s Day, graduation, or even weddings. Wouldn’t these be cool as wedding favors? Or even as a make and take project for a summer birthday party? 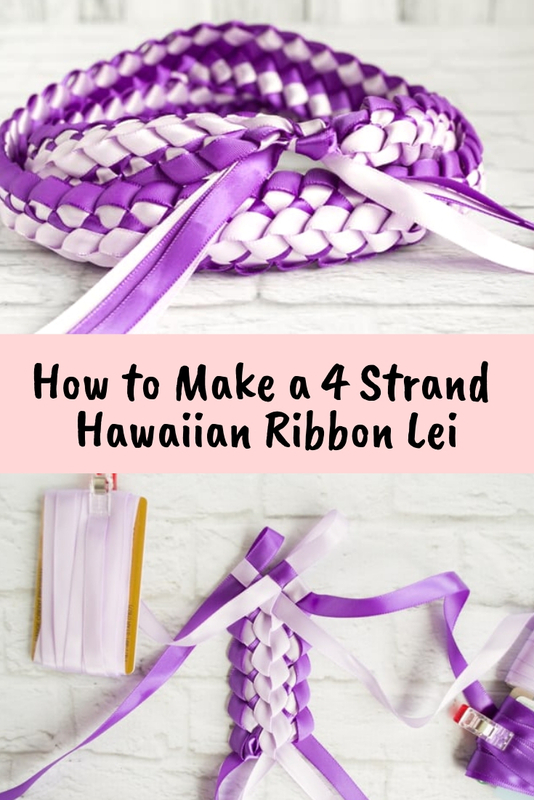 Because this lei uses four strands of ribbon, you can us anywhere between one and four different colors. I think two or three look best, but the choice is yours. 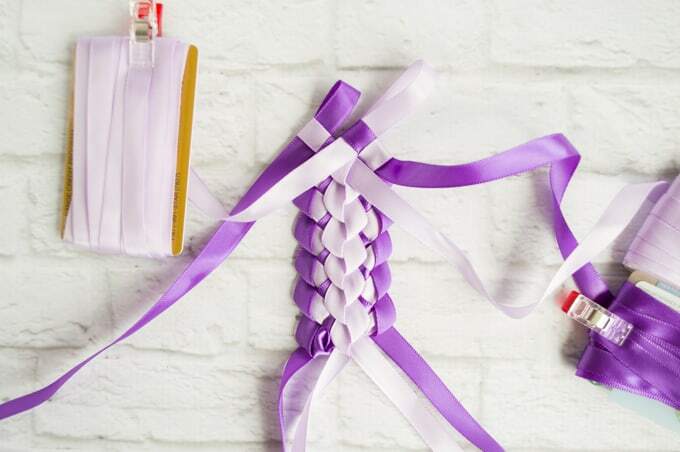 The example is made with two colors of 3/8″ ribbon. 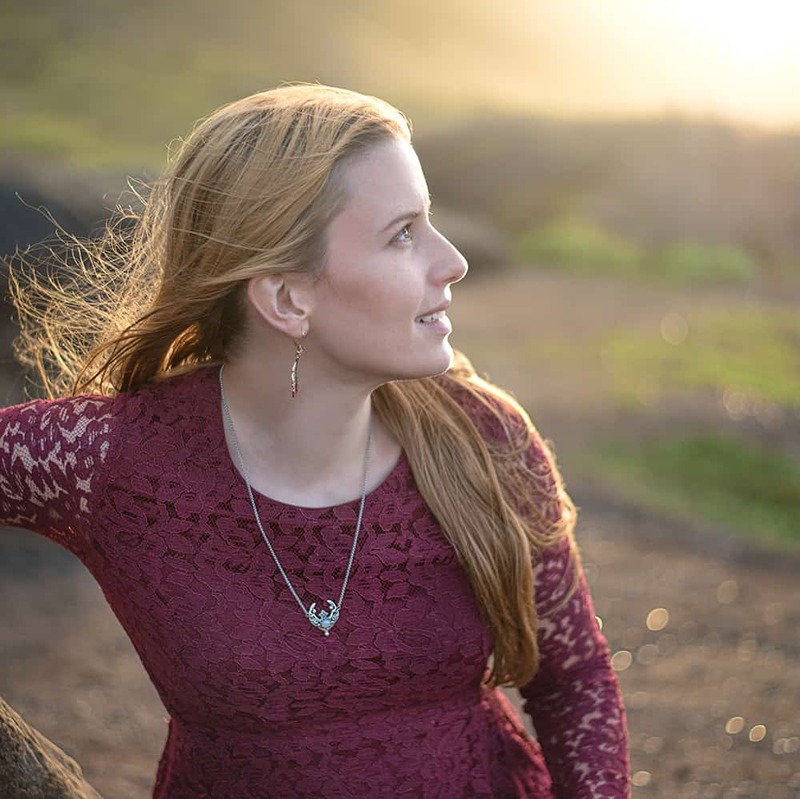 Using 3/8″ ribbon for this project creates a pretty wide finished lei (mine is about 1.5″ across) that shows up really well in photos. The exact amount of ribbon you need depends on how wide the ribbon is and how long you want your lei to be. 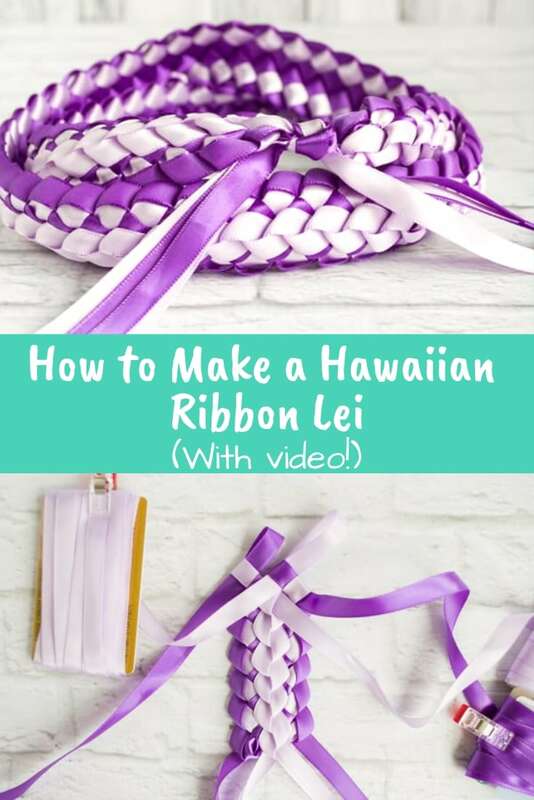 Most lei have about a yard of actual braiding, but you can make them longer or shorter. I recommend starting with pieces of ribbon that are at least 6 yards long. 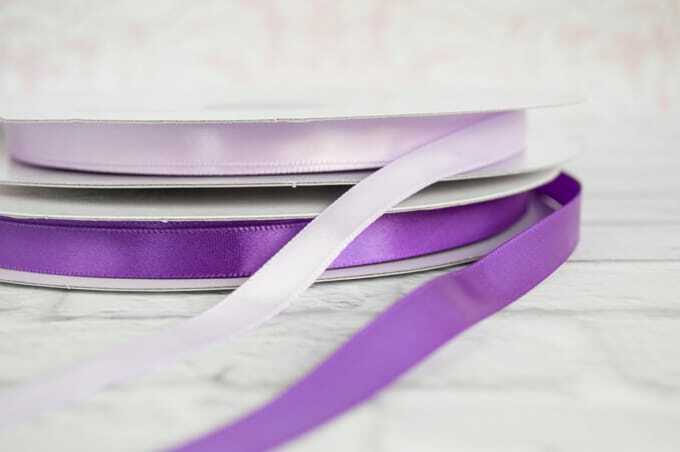 Basic satin ribbon is pretty inexpensive – this project is all about the time you put into it, not the cost in dollars. I think it’s better to waste a few feet of ribbon than the hour you put into perfecting the technique and making a lei! Okay, so maybe not a whole hour, but still. 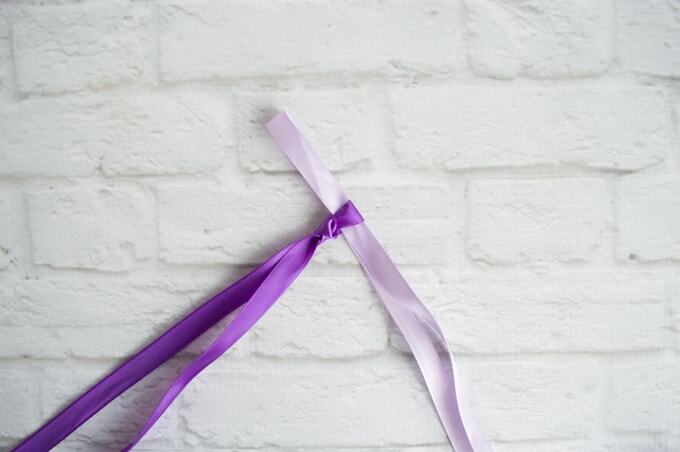 Cut your ribbons at least 6 yards long, preferably 7 or even 8. 1. Prepare your ribbons! 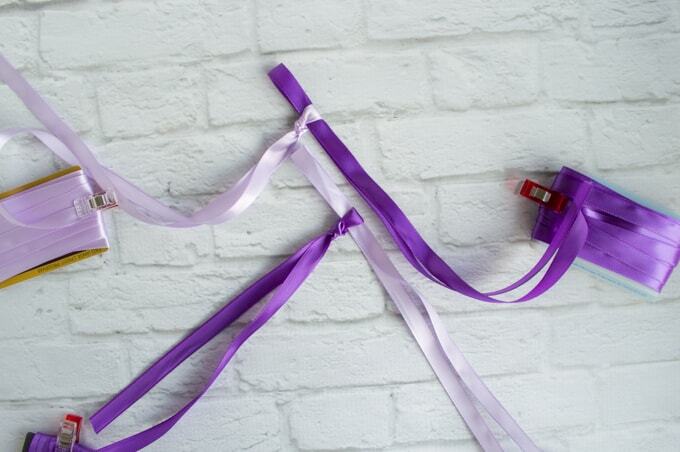 Use an old gift card (or something similar) as a bobbin to wind up each piece of ribbon. Wrap the ribbon securely, but don’t pull it super tight around the card or you’ll end up with odd creases! 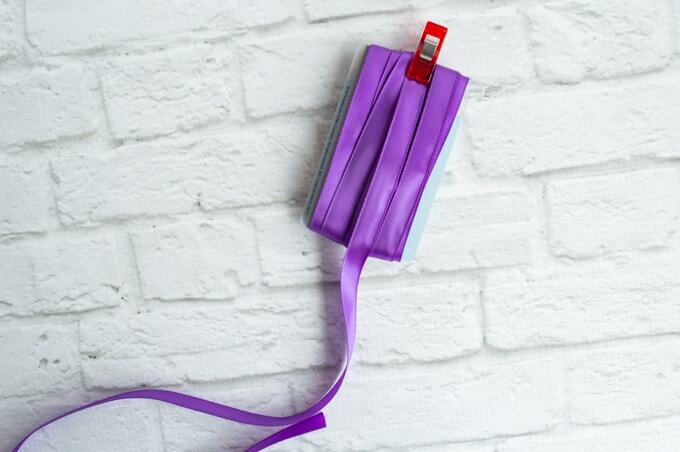 Make sure to leave about a foot of extra un-wound and secure the ribbon with a binder clip or Wonder Clip. 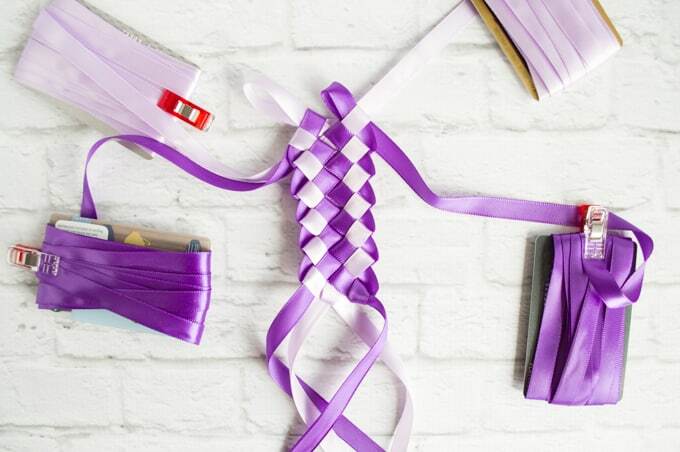 Wrap each piece of ribbon around a separate card. 2. Pair off your ribbons. I used two pairs with a light and a dark purple each. These ribbon pairs will be buddies for the rest of the lei! They’ll interact with the other pair, but only ever actually truly work with their ribbon partner. 3. Tie a slip knot in one ribbon from each pair, making sure to leave a good 6-8 inches in tail (or more, if you’d like to tie a fancy bow). 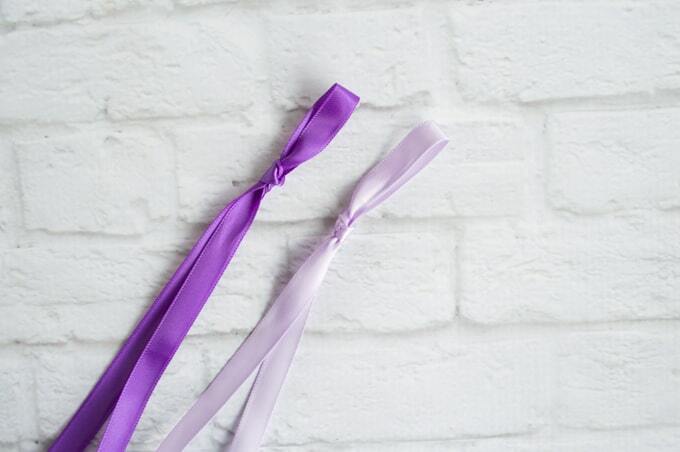 This is really important: tie the knots on different colored ribbons. I tied one on a light purple and the other on a dark purple. If you tie both of one color and leave both of the other color loose, your lei won’t look like mine. 4. Fold over a little bunny ear loop, as if you were making a bow while tying your shoes, and insert this loop through the slipknot of its ribbon partner. Snug the slipknot down. Repeat with the other set. 5. Now it’s time to get set up for your braid! This step is very important. If you don’t set your ribbons up as shown, your lei probably won’t stay together in one strand. 7. Keep going until your lei is as long as you want. On the very last loops, pull the ribbon all the way through instead of leaving a little bunny ear sticking out. 8. Tie the ends together and finish with a bow, if that’s your style. Trim the ends and singe them quickly/carefully with a lighter to prevent fraying! 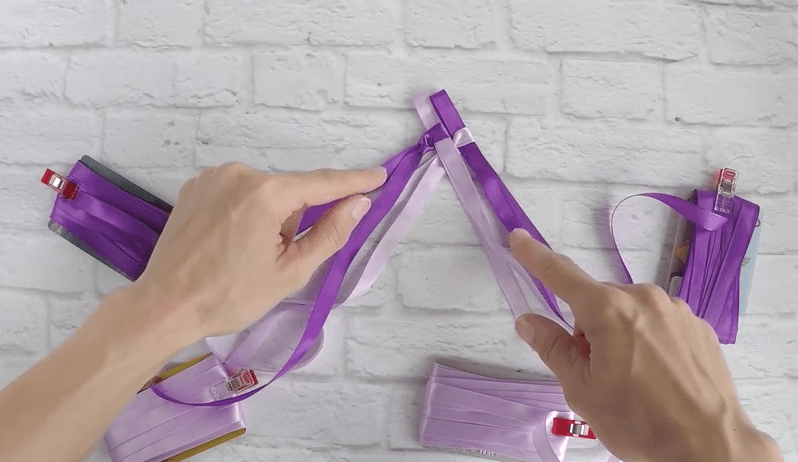 Satin ribbon will fray like nobody’s business, so this is a really good idea. 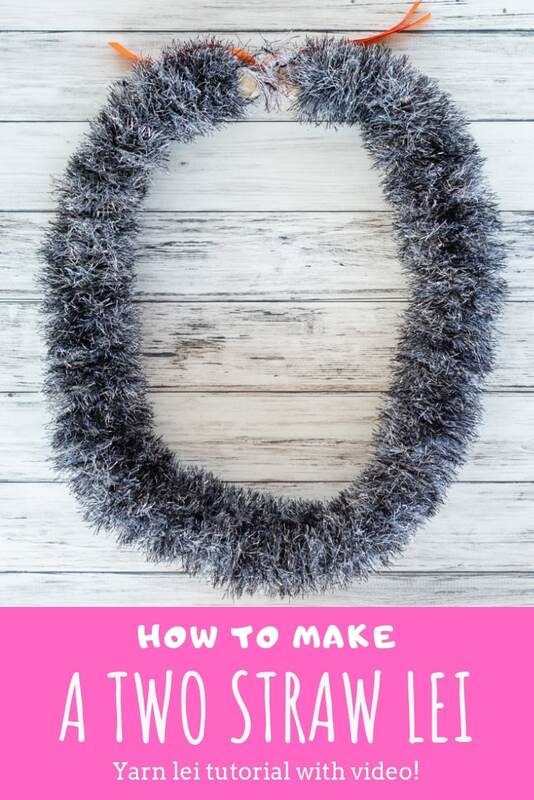 Don’t lose track of this lei tutorial! Pin it to your favorite craft board now! 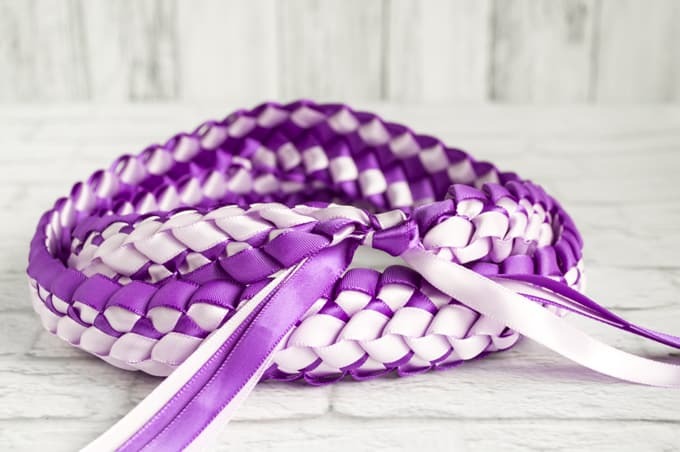 If you’d prefer to make something a little quicker and easier, check out the simple braided ribbon lei tutorial right here! You might also be interested in this lovely two straw yarn lei. 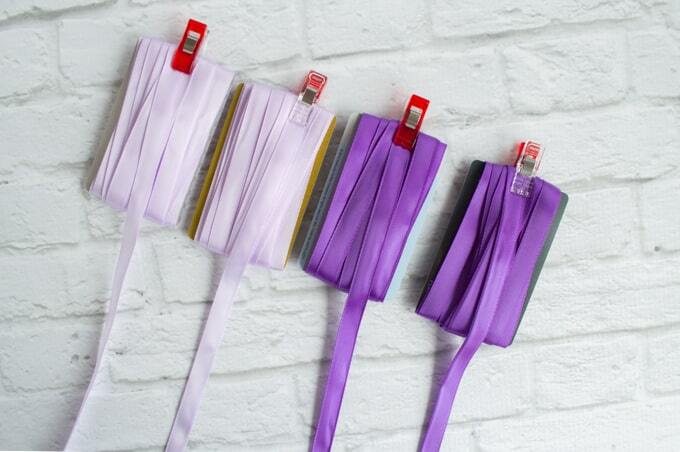 It’s another great option when you want to use several colors for a graduation lei! Who will you make a lei for? Thanks for the tutorial! Took me a few tries to get the hang of it but once I understood how to do it it went smoothly! My graduate will be thrilled to wear this tomorrow! I have also followed your tutorial for the two strand lei before and those came out great on the first try!